Two-lid willow basket with deluxe service for two. 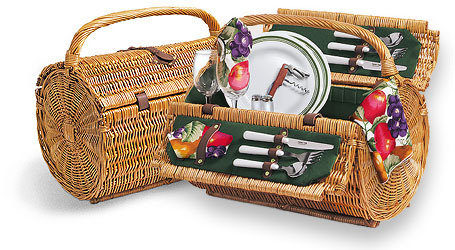 The exquisitely handcrafted Barrel picnic basket was designed for the picnicking elite. This uniquely designed, double-lid rattan basket is lined with canvas, and is very versatile as well as stylish. Ideal for any gift giving occasion, it's a wonderful gift for the honeymoon or anniversary couple! 2 plates (melamine 9"), 2 napkins (cotton 14" x 14"), 2 wine glasses (8 oz. ), tablecloth (cotton 45" x 45"), 2 each stainless steel knives, forks and spoons, a set of frosted glass salt and pepper shakers, waiter style stainless steel corkscrew. Cloth patterns may vary. Ask about pricing options to stuff this basket with gourmet goodies!